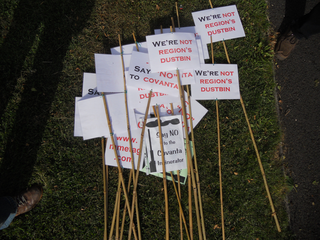 Mayor Dave Hodgson has described the High Court ruling which against Covanta Incinerator's (BACI) claim to quash the environmental permit for the Covanta Incinerator at Rookery South Pit near Stewartby as a 'dreadful blow' to nearby communities. Mayor Dave Hodgson said: "This is a dreadful blow to communities in the vicinity of the planned giant incinerator. The BACI team of volunteers deserve huge credit for the incredible battle they have fought on behalf of local residents. At the very least a clear message has been sent to Covanta and all regulatory bodies that every move will be watched closely and that residents will fight tirelessly for the good of their community." Councillor for Elstow, Stewartby and Kempston Hardwick Tim Hill commented: "This is terrible news. I find it difficult to see how the Court can find there were scientific and factual errors and sill allow the permit to stand. This is very disappointing for all involved in BACI's campaign, and I for one will continue to campaign against any incinerator in our area." You can read BACI'S press release in response to the judgement on its website, here.